Pre-heat the oven to 400 degrees. Coat a baking sheet with olive oil spray. Peel the squash, remove the insides and sliced into C-shapes, or whateven shape you prefer. Add the sliced squash to a bowl with 1/2 TBSP olive oil, the garlic powder and a pinch of sea sal and pepper. Toss to coat and spread evenly on the baking sheet. Bake for 20 minute, flip the squash to the other side and bake for 20 more minutes. Remove from the oven and set aside. Heat a large skillet over medium-high heat. Add the remaining 1/2 TBSP olive oil. Prepare the brussels spouts by cutting off the end and slicing in half. Add the brussels sprout to the pan and cook for about 5 minutes, stirring every so often. The brussels sprouts should be slightly tender. Remove from the heat and set aside. In your serving bowl add the salad mix. 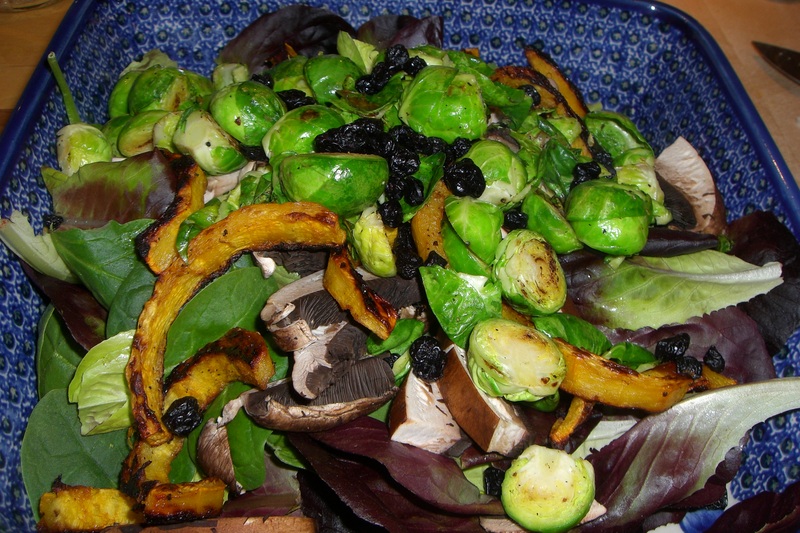 Top with the sliced mushroom, cooked squash and brussels sprouts and dried blueberries. Serve with this yummy balsamic vinaigrette.